Ethiopian cuisine is very vegetarian friendly. 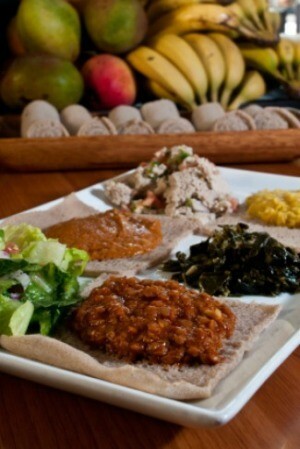 This page contains vegetarian Ethiopian recipes. Want to impress your friends at your next dinner party? 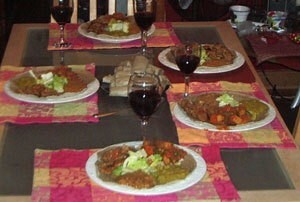 If you are having a party and need to feed lots of people for very little money, have an Ethiopian feast! Not only is it inexpensive but it's a lot of fun, you get to eat with your hands! I made this for guests recently and they were so impressed. Ethiopian food is not eaten with cutlery yet they use injera (kind of like a crepe) to pick up the food. The food is served on a large platter or plate (see photo) with salad in the middle and the other dishes around it. This is the spice mix used in many Ethiopian recipes. Preheat oven to 300 degrees F. In a cake pan, mix the spices well (be careful not to inhale). Roast for 20 minutes, stirring every 5 minutes to prevent scorching. Watch carefully and stir the spices more often during the last 10 minutes. Cool and store in a sealed container in the refrigerator or freezer. This is the spiced oil (butter) often used in Ethiopian cuisine. I use an inexpensive margarine block and store the finished product in a plastic container in the fridge. Slowly melt the margarine in a medium-sized saucepan over low heat. Add the other ingredients and simmer uncovered on the lowest heat for about 20-30 minutes. Do not let it brown. Strain the mixture through a double layer of cheesecloth, discarding the spices. Refrigerate until set. Use as needed in Ethiopian recipes or spread sporadically on toast. One of my favourite dishes. This can be done in a crockpot. Bring to a boil then simmer for about 4 hours, until the cabbage is dissolved and there is a thickness to it. Wash the greens well in a sink full of water; drain. Cut off the coarse part of the stems (about 1/2 - 1 inch). Chop the stems well and set aside. Chop the leaves coarsely and set aside. Season with salt and pepper and arrange on injera with some other stews. This is a vegan version of Doro Wat, an Ethiopian chicken stew. I found it on a nice vegan blog called Vegan Dad. I substituted the seitan for TVP and it turned out amazing! You could also use tofu. Fry onions in a dry pan over medium heat, stirring constantly, until onions are a deep golden brown. Add in niter kebbeh, berbere, salt, and blend well. Add in seitan and fry for 5 minutes. Add in tomato and water and simmer, uncovered, for 20 minutes. If stew is too thin, mix flour into water and add into stew. Serve with injera bread. Saute onions, garlic, berbere, and paprika in nitter kebbeh for 5 minutes. Add beans, carrots, potatoes and saute for 10 minutes. Add tomatoes, tomato paste, and water. Mix well, bring to boil, reduce heat, and simmer until veggies are tender and stew is thick. Season to taste with salt and pepper and serve. This is so easy! I make it in the crockpot. I find this dish tastes more flavourful the next day. Saute the onions in the olive oil, until the onions are translucent. Add the garlic and ginger and saute for another minute. Add the berbere and saute for a few minutes more, stirring occasionally to prevent burning. The onions should start to caramelize. Mix in the chopped tomatoes and tomato paste and simmer for another 5-10 minutes. Add the lentils, tomato paste, salt, red wine, and the vegetable stock or water and bring to a boil, then turn down to a simmer and cook uncovered for an hour. Serve with injera and a vegetable. This is a dressing that is used on the garden salad which is always placed in the middle of the plate surrounded by hot dishes. The garden salad usually consists of lettuce, onion, cucumber, and tomato. This is the crepe used to lay the food on and also served on the side to pick up the food. It is originally made with teff flour, the mix is supposed to sit for a few days, but this is my quickie version. Mix the dry ingredients and add enough soda to get a liquid consistency, much like a crepe batter (thinner than pancake batter). Use a ladle to pour into the hot pan and move pan around until covered with a thin layer of batter. You'll see bubbles appear and when top seems set, remove from pan. Do not flip over. Keep doing this till batter is all gone. I miss Ethiopian food so much because there are no Ethiopian restaurants where I live now and used to eat at my local restaurant a minimum of one time a week in Grand Rapids, Michigan. Has anyone eaten at the Cafe Nile in Kansas City? Do you have any recipes for food similar to that served there? Do you know of any restaurants in the area that serve similar food? Thanks. Editor's Note: Thanks for letting us know. Injera is the traditional flatbread of Ethiopia and Eritrea. It is make on your stove top using a batter of teff flour (available online and in markets), water, and salt that has been allowed to ferment for a couple of days. 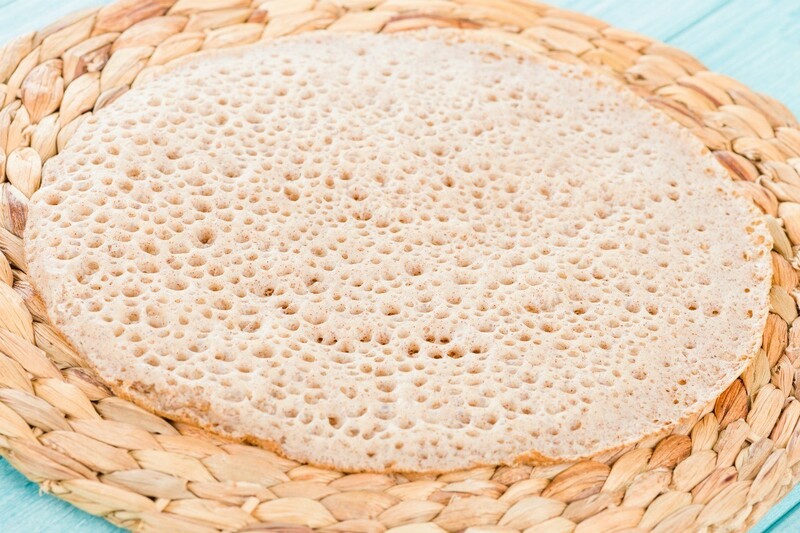 This page contains an Ethiopian injera (flat bread) recipe.